So I managed to get 10 of the nameless red cabbages in. Instructions said a foot apart. Uh, not unless they're miniature ones, so they went in the usual silly distance apart in two rows. Had a struggle with the mesh as predicted, not so much because of the wind but because the soil at the edge of the bed was indeed the concrete and I couldn't easily get the water pipe to go in! Eventually managed to get it nailed down though there's more gap at the base than I like. But no pigeon access. That'll do for now. Reds aren't as susceptible to flea beetle in any case. Cut down the comfrey which was getting a bit out of hand again, stufing it upside-down into the compost bin to stop it rooting. That gave me access to the now-mad rhubarb. That lost the next battle, and gave me a large pile of crumble fodder. Finally decided to pull some of the self-set garlics, which are the precise size of large spring onions, and because whole bulbs grew, there's lots. One bed I've almost given up on, since it's always got so many garlic in I can't plant anything else. Well at least it by now is well-adapted to conditions in my plot! Also discovered I've now got some of the herb that is invading a lot of plots. Very serendipitous (even if I've no clue which herb it actually is. Perhaps I ought to post a photo here and see if anyone knows... I'd plump for marjoram or oregano but the plant's not upright and bushy.) Picked some, and also some sage (which is going to be covered in flowers soon), and figured I could add them to tomorrow's chicken carcass when I start making stock with it. Lurched back to the gate and home, to discover Daddy and son had gone to the park, so I could have stayed longer. Bah! Day off, and more easy peasy potting in the shed. Drizzly outside so really nice to be in the dry and still doing something. Now I've got a heated prop full of French beans and squashes. Seeds are a bit old (might as well use the stuff I still have before buying new) but there's only one way to find out if they'll grow! Need to sow sweetcorn too; that will mean the smaller heated prop and finding somewhere out of small hands' way to park it. Then runners, which I shall start on kitchen roll as usual. Those seeds date from the potato day in 2006 (heck) so are going to be a bit of a challenge. Wish I'd got power in the shed, but I haven't so can't put props on in there. Shed is meanwhile looking like chilli central. I´m putting most of them in the final-size pots so at least I´ll know how much space I´ll (not) have left. 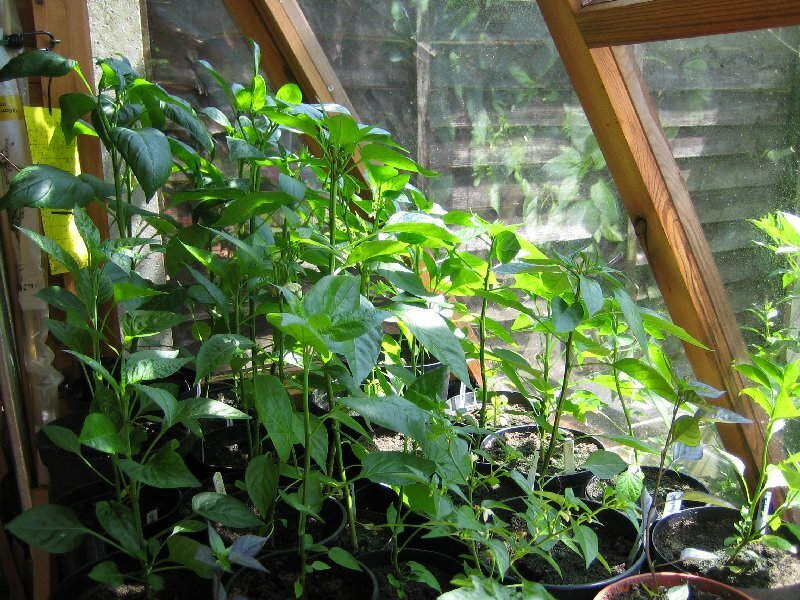 Weather forecast for the weekend is pretty dreadful (20mph wind and rain) so it looks like the shed will be getting another visit as I pot on the remaining chillies and sow the runner beans, and the minicole cabbages will have to lump another week in their pots. Hurrah - managed to escape the house during naptime again and shot up to the lottie with my minicole cabbages. They´re a bit leggy now sadly and need a drink - but they´ll pick up ok once they´re in and watered. 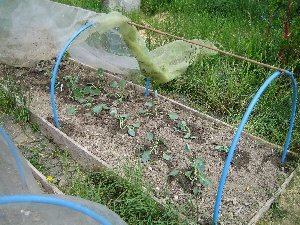 The bed is the one next to the red cabbages so thought it shouldn´t take too long to get it up and running. 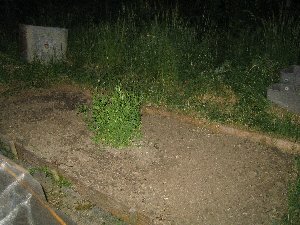 Didn´t bargain with a monster seeding chard plant, which resisted all my efforts with a hand fork to remove until I´d excavated a pit and tugged with both hands. In went a dozen minicoles and there was even room at the end of the bed for another one of the red cabbages (also leggy, so shall see how it compares with the happily growing ones in the tent next door!) That was the easy bit. Getting the mesh off the old bed was tricky (weeds had grown into it) and then getting that over the bed was again a bit of an argument, but we got there in the end. This is the halfway stage where I was putting the mesh over the hoops. Yes it is green - algae! That should sort itself out in the much better situated bed. 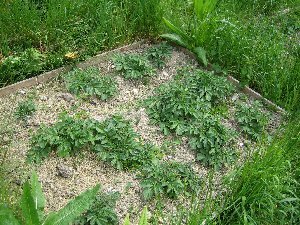 Here´s the bed of Charlottes - not doing too badly, though as usual where I put the earthing up and where the plant is are two different places! Not too much bindweed; that honour went to the other potato bed which is riddled. I settled for just pulling it up where I could get a grasp so it´s weakened. Raked up a bit of soil around the emerging maincrops. Meanwhile, I mentioned a week or two ago that I had no idea of the identity of a herb that we find all over the place. Here´s a photo - anyone know? 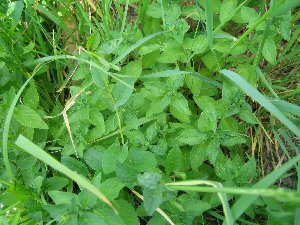 It´s herbaceous rather than woody so not sure if it´s oregano or marjoram, but...? Anyone know, please email me! Made it home a bit too early (small person still asleep) and took the opportunity to finish the cold frame dismantling. Should be simple to get back together when I need it. Meanwhile, more junk in the shed! Discovered in the task of weeding bindweed out of my side bed that the monster clematis montana has defied the textbooks and is resprouting from the stumps I left after my March hatchet job. 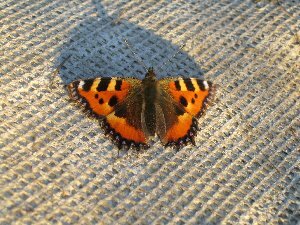 Ho hum - this time it´s staying under control, and at least I hadn´t got round to removing the trellis! Well here´s the other shot I´ve been meaning to put up here. Chillies! I may not have much going at the allotment as yet but these little ones are growing like the clappers and flowering. It´s now more a case of whether they´ll outgrow the potting shed before they´re ready to pick... The shed was situated in full sun, technically, but a conveniently-overgrowing hazel is functioning nicely as midday shading, so shouldn´t get too much scorch, especially if we get the hot summer the weatherpeople are currently predicting. The aubergine I got from the plant sale at the Horticultural Society is taking off, which is nice. Next - plant up the tomato baskets and find somewhere to hang them as this shed´s not exactly the most convenient design for hanging baskets. Sometimes small boys go to sleep on time and sometimes Mummys do get to finish a meal before 8pm on a warm, fine night. When the Mummy in question has an allotment and is desperate to get it productive again, this can seem like a miracle. I got up to the plot for the second time in a week with no more than my trug of hand tools and some modules of cut and come again romaine lettuce (Valmaine). These were in plugs of 4-5 seedlings: I'll figured I'd leave some of them in the clumps and tease out others. But planting them would be the last thing I'd do - I went up to weed and weed I did. Started on the partially-cleared garlic bed and worked my way across to the sage thicket. Found quite a few garlics as I did so. Also this time I'd remembered my knife so was able to cut away a lot of the grass clumps on the paths. 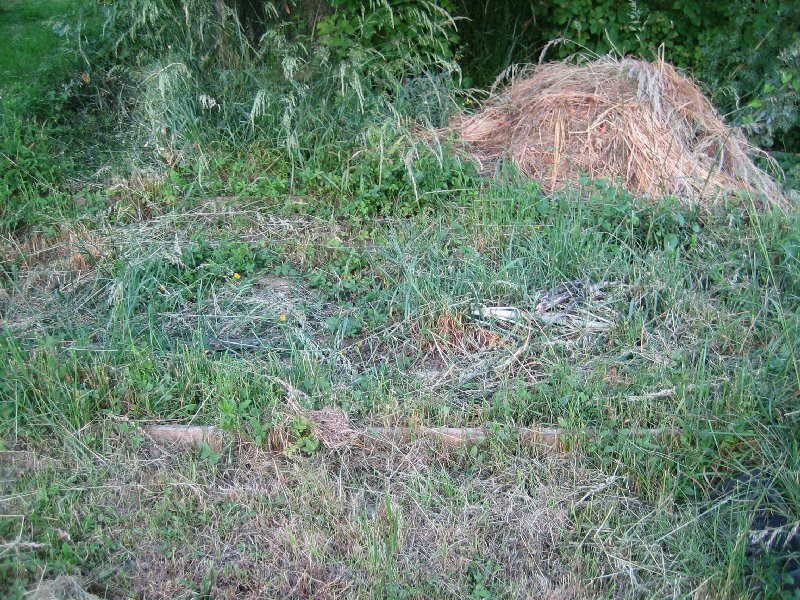 Gradually the pile of weeded grass grew to huge proportions and had to be piled up on a bed I've not got to yet. But then I was faced with my other fairly urgent task, weeding the permanent runner bean bed. There are 12 canes fixed to the wire. By the time I couldn't see what I was doing, there were 8 of them free of grass clumps and two more weren't that far off being cleared. So I can immediately plant my purple sprouting broccoli (around the garlics until they are dug up!) and runner beans when I've got some up or have bought some plants. Hurrah! And as expected, shoved in three of the clumps of lettuce by the end of the red cabbages. We'll see if they get munched. Still have three more, which I will probably put in a large pot. Quite a few folk were up there that I've not seen for a long time, which was nice. 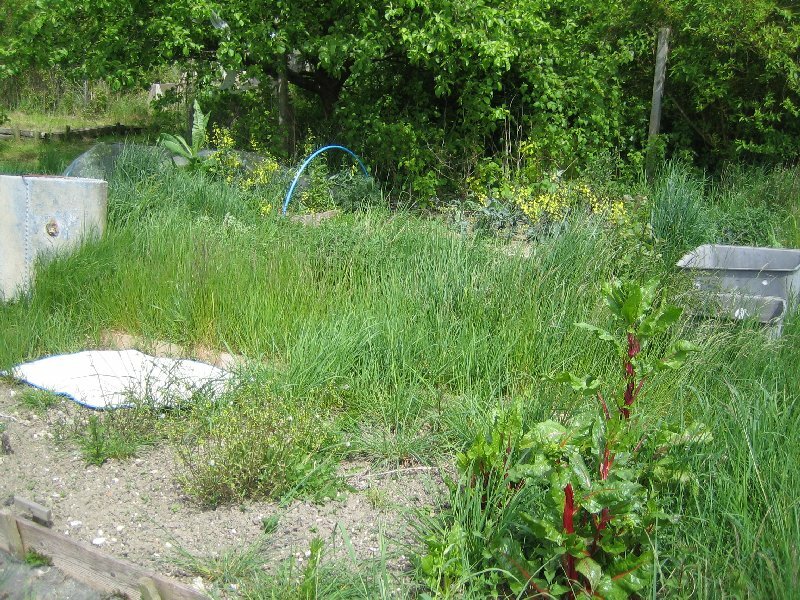 And one plot I noticed had more grass than mine, which perversely made me feel a lot better! And I saw a bat. Felt nostalgic for ages past... and I really must get up more if the evenings are nice! Think I gave Yvonne a fright. Three times up to the plot this week - more than the previous month! Another wonderful evening, clearer and a bit cooler than last night. Chris was up there, so was able to give her a couple of chillies. Tonight's plan was simple: finish off the runner bean bed, sow a load of the seed I found saved at the bottom of the tin, and plant the purple sprouting broccoli. Let's see if it works this time. Over the past few years I've had failed germination, cauliflowers (! ), tiddly plants, and the plants from whopping giant land which must have been fantastic but I never got to see or eat them as I was swearing I'd never eat food again at that point. These ones were from the HortSoc plant sale, nicely labelled 'Claret' which is a late one but heavy cropping (March to May). Probably similar to the one I didn't get to try! Nice healthy plants, if a bit rootbound in a plastic supermarket tub. Pulled them apart and managed to get eight into the bed, with a bit of weaving about the garlic. They take so long to grow that the garlic'll be long gone by the time they overshadow it. Was glad of Chris's help in the netting; luckily I'd found a new pack of it in the potting shed so it wasn't a problem, and we found five of the metal support rods of the six or so I'd had on the previous PSB bed. I know at least one was broken by vandals, so we improvised with a real cane and I'll acquire a replacement next time I'm within hailing distance of a Homebase. 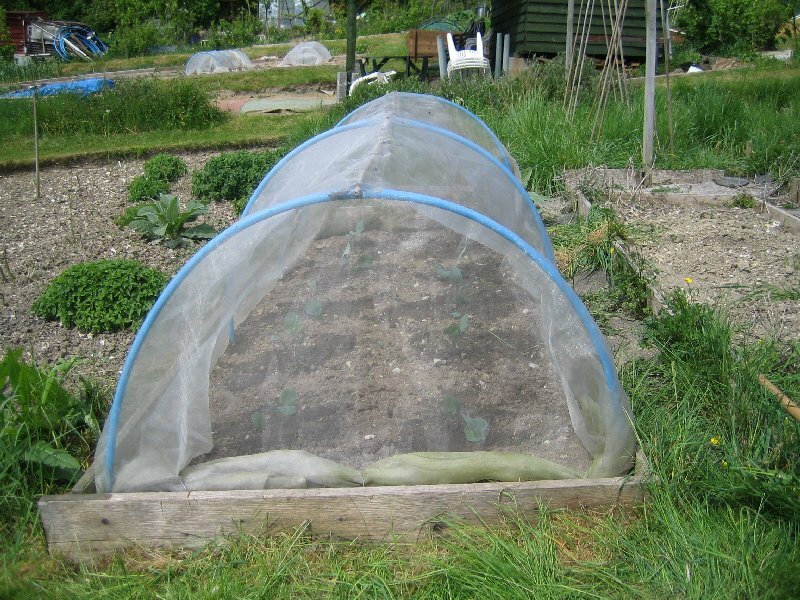 Pegged down to keep out the pigeons and cabbage whites, and watered in. Another bed done! And yet another evening up the lottie. Having found several packets of Sweetcorn Lark F1 over the weekend (and sowed the most recent) as well as some runners and some courgette Defender and Gold Rush, I thought I'd better get somewhere to put them! My bed rotation is simple – clear the next one along and plant it, move on to the next. The next one this time was full of bolting chard. I decided after the tug-o'war I had with the last one, I was taking up the big fork! Levered them out easily, and also all the tufts of grass so I could get them out easier with the hand fork. So it turned out. And I have before and after photos (admittedly the after with flash as it was so dark!). Yes I know, there's a whopping poppy in the middle of the bed. I like poppies. It will be over by the end of the month so it can stay there in the meantime and cheer up the bees. 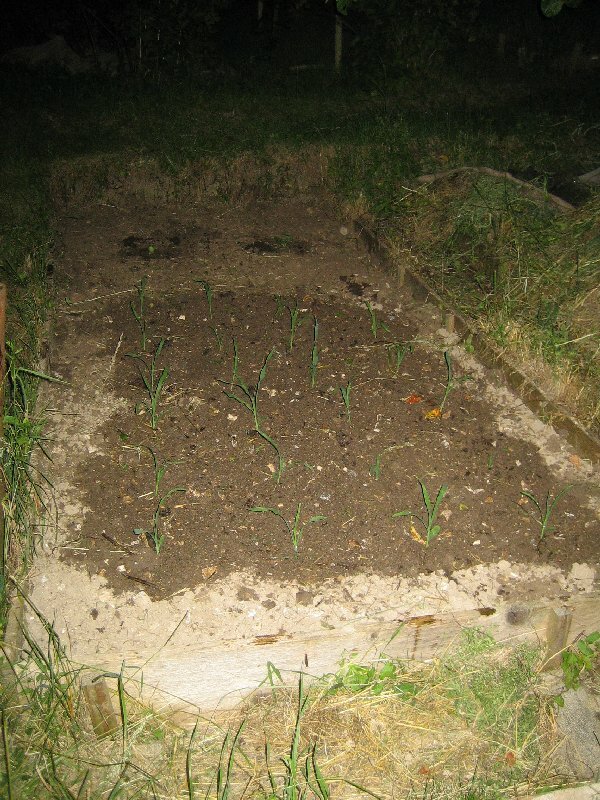 Maggie donated some extremely weird leek pips – bulbing – which went in beside the lettuce, which are doing nicely. The PSB looked a bit thirsty, which was easily solved by Chris who happily watered my beds as well as hers, so I could get the bed finished. What goes in it? Well I reckon the next thing to be ready. Suspect this will be butternut squashes, since I've now got seven of them up. If it's as hot a summer as they threaten, butternuts should do well. Could do with sweetcorn up, but they have gone in roottrainers and will therefore be good for a week or two before being planted out. Will attempt to get up again tomorrow, all things permitting! yes these are taken from the same position and angle! Another hot day, but clear signs of the weather changing and fronts coming over. Didn't stop it being a lovely warm evening again, and me getting to the plot for the second day in a row. This time it was the bed the great pile of grass was on. Oops. Moved the grass to the one under the Bramley, as I don't think that is going to be very much in cultivation any more, being too shaded. Then got adding to it. 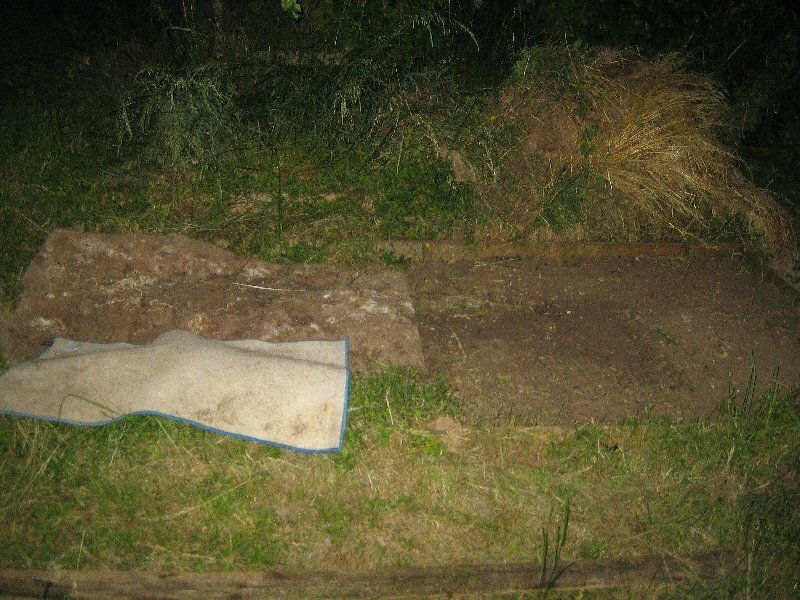 Problem with this bed is that the grass on it isn't the same as that on the other beds - it's mostly couch and not the nice, easily removed clumping sort. So a few muttered grumbles as I tried to work through it. Still think I could do with Doctor Who to get rid of it, as it's certainly a baddie I'd like to get shot of and nothing else works! That and the bindweed. Pah. Had to work fast on this one - it's perhaps the biggest bed yet that I've tried to get going again, and since I've set myself a sort-of target to weed one bed a visit, it was hard going. In more ways than one - the soil has now gone to concrete. Need more rain to soften it up again. Didn't get down to more than a few inches in places, but it's supposed to be no-dig anyway and so no real hardship. Chris asked what I was going to put in it and I had to confess no idea! I can't really put the butternuts there, as they're usually so rampant that the Focal Point would forever be persuading tendrils to stop invading, tempting though the thought is! So it'll probably be courgettes and perhaps a few French Beans. I was digging out a lot of volunteer Sarpo spuds, so it'll not be a potato bed next year either. 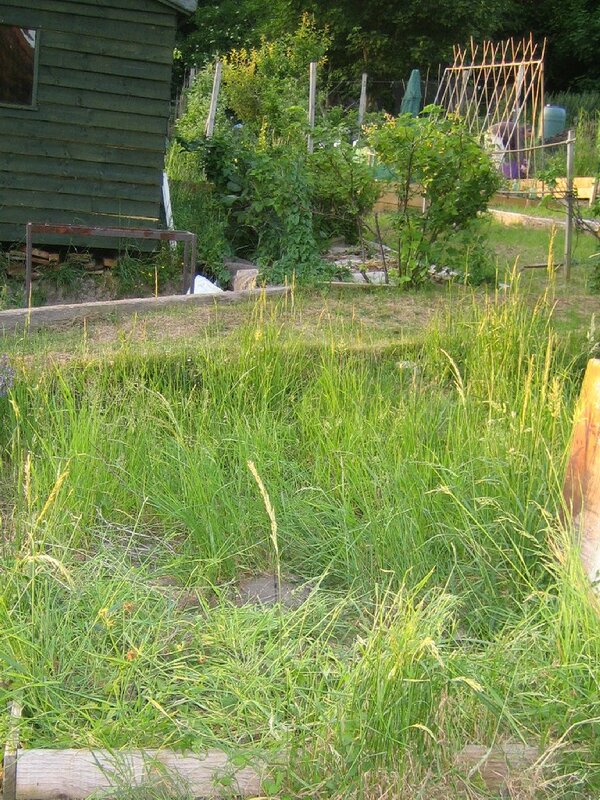 Of course if the sweetcorn grows, that will need a home… I shall have to see! Before and after photos again. 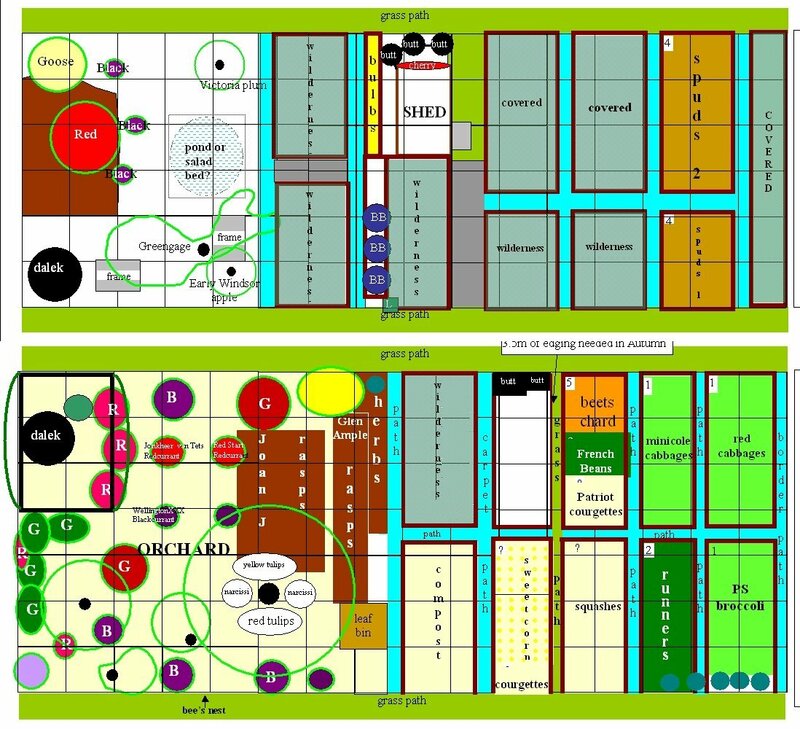 Encouragingly, I´ve now got six beds in a block done on this side, and two on the other. Six are planted up already. Depressingly, I´ve got 12 more to go, though admittedly two will be largely abandoned due to tree root encroachment and shade. 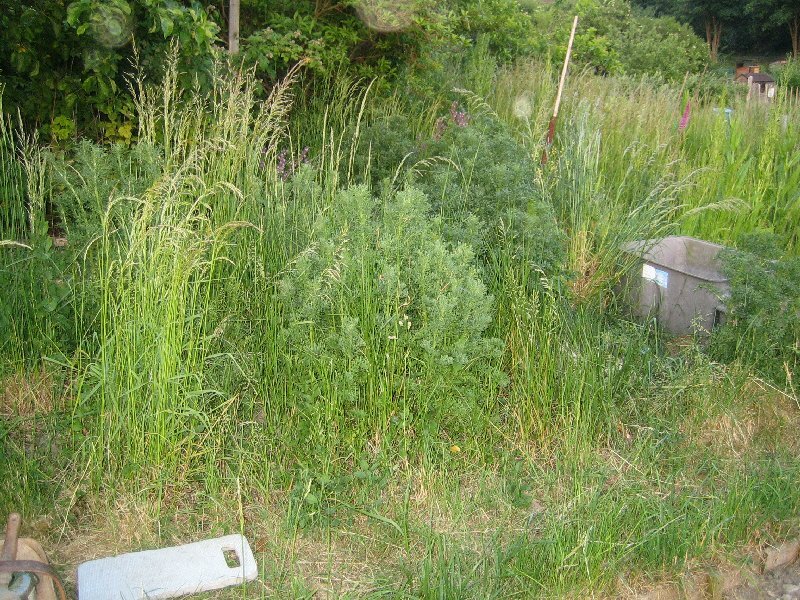 Suspect I might eventually move the mad sage bushes! Others are partially covered with carpet or black fabric, so may (!) not be as bad to regenerate. And will be the last to do, for sure. Next visit: the bed by the water tanks. This one has a small tree in it for some reason, as well as a lot of broad-leaved weeds and couch, but at least is smaller. Before and after: I left in a few previously-swamped pot marigolds. Up later than expected thanks to small person being bouncier than usual, so it was about 9pm when I finally arrived. Didn't expect to be able to do much at that time, especially given the state of the next bed. 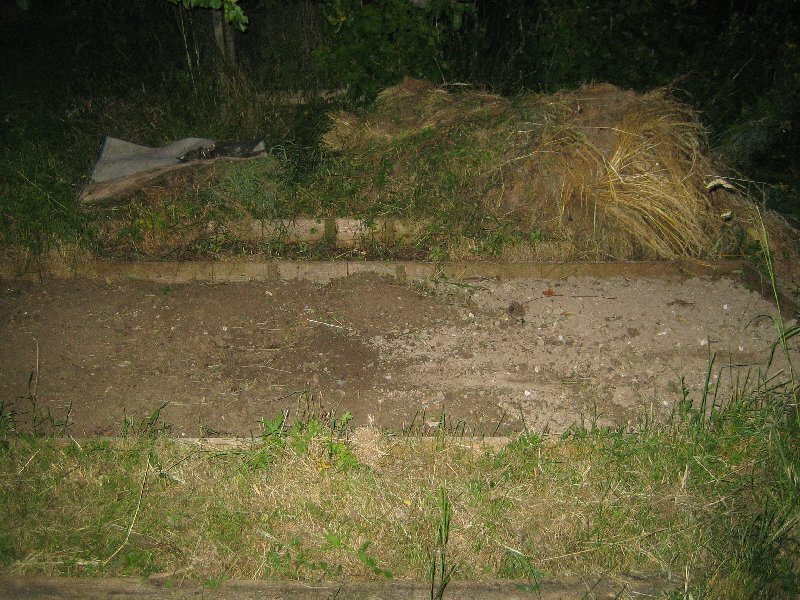 The soil is now gone concrete, and most of this bed is a hideous combination of ragwort, bindweed (both types) and couch grass. And I forgot my big fork. The one mitigating factor is that there is carpet down one end, though the grass growing on it seems to be as thick as that in the soil! Did my best in the hour I was there, having to wiggle in my handfork for every lousy weed. I didn't do too badly, but I need to get up there early next time so I can finish it off! Stopped before 10 and watered everything. Maggie's leeks aren't too happy but everything else is doing quite nicely. Light rain is forecast for tomorrow afternoon, a nice evening then heavy rain from Saturday until Tuesday. If we don't have frost, which earlier today was forecasted to happen Sunday night. Well at least the soil won't be concrete for much longer, and I won't have to water anything. Back home, I´ve still no courgettes up, but I do have an unbelievable two more butternuts. I now have nine! I know from experience that six of them will fill a bed, so I guess if all else fails, I could dig a hole in an unweeded bed and bung a plant in. Or see if anyone wants a swap. No beans yet either, but I have a suspicion that the sweetcorn is germinating, having risked finger blight! Before. No after, cos I´ve not done yet! Be careful what you wish for. Total rainfall for today was a staggering 2.7" (6.86cm) so I didn´t get an awful lot of gardening outside done. However inside was a different matter. After a trip to South Heath, I was up one pack of Enorma runner beans, one pack of Patriot courgettes and one pack of Long Green marrows. 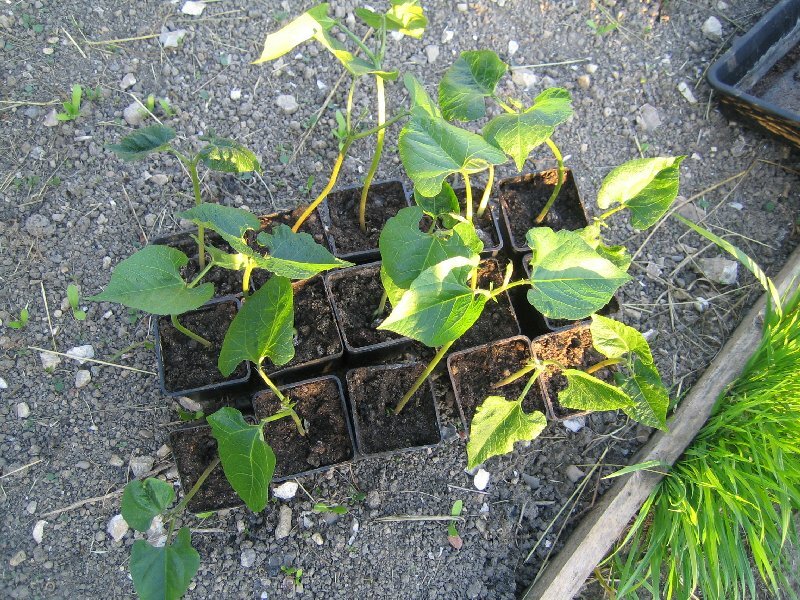 Beans put to chit, several cucurbits sown per 5" pot (I´ll transplant when (!) they germinate) and pots parked outside so they get watered. There are now nine sweetcorns up (of 24) though none of the last lot of `found´ courgettes. And yet another butternut! That´s ten... The last time I grew them with any success I planted six of them in one bed and got 16 squashes, so I am quailing at the thought of what to do with the potential produce. Admittedly this is assuming they actually fruit, the horticultural equivalent of counting chickens before they´re hatched. So we shall see. Meanwhile the mixed lettuce seed I found in my seed tin has laughed in the face of age and germinated happily, so I now have three little pots full of seedling cut and come again lettuces. I also bought an indoor cucumber plant, having given up hope of finding one this late, naturally I did. Now in a big pot in the shed, by the window. I can now say with total honesty that the shed is full. Even the potting tray has a couple of seed trays in. Feedback time: a couple of years ago I bought a reel of self-adhesive copper tape from the organic gardening catalogue to hopefully stop slugs and snails. I stuck it round the auto-vent of the potting shed to keep mountaineering snails out, and then round the pot in which I grow my usually-shredded hosta. Two years on (last year of a particularly rainy one) and I can say with total glee that it works! I have to make sure the hosta´s leaves don´t touch anything else or they´ll use it as a bridge, but it´s a lovely garden centrepiece, stuck in the middle of the lawn (and fortunately small boy-proof) and has no holes in for the second year. 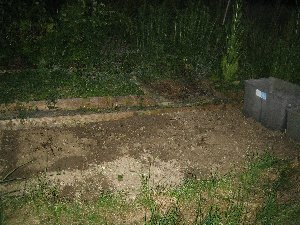 I do sweep under the pot rim occasionally to see if anything´s made it across, especially after rain, but so far, so good. Pleased. Worth the cost in this instance! Talk of the sublime to the ridiculous. 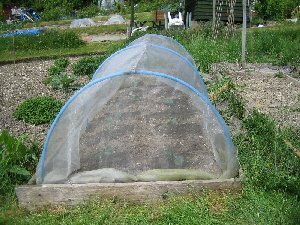 I now have six long green trailing marrows up, three Patriot courgettes, one from the old packets that´s been in a roottrainer (and I can´t remember if it´s a Defender or a yellow one), and 23/24 sweetcorn (and a root coming out of the tardy 24th). 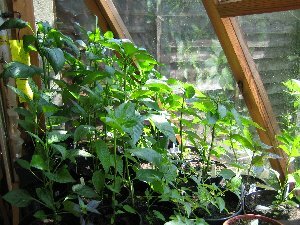 On top of that, 14/16 runners have chitted and been potted up (as have the last two, just because I figured they would get there in the end). 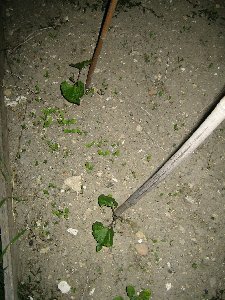 Some are already poking their leaves through the compost. From having none I´ve now got loads. Just need to get to the plots again to plant them! A nice end to a grotty weekend where I wanted to do loads and then ended up in bed with a horrid lurgy. Better late than never, but I have always gone by the 'they'll catch up' mantra instead of 'plant them early' as it's more often true. Especially if it stays warm into September as it often does these days. Up to the plots at last, to try and finish weeding the bed I started the other week. To my astonishment the ground is back to being as solid as a rock, but then again I didn´t make it up at the weekend thanks to the bug. 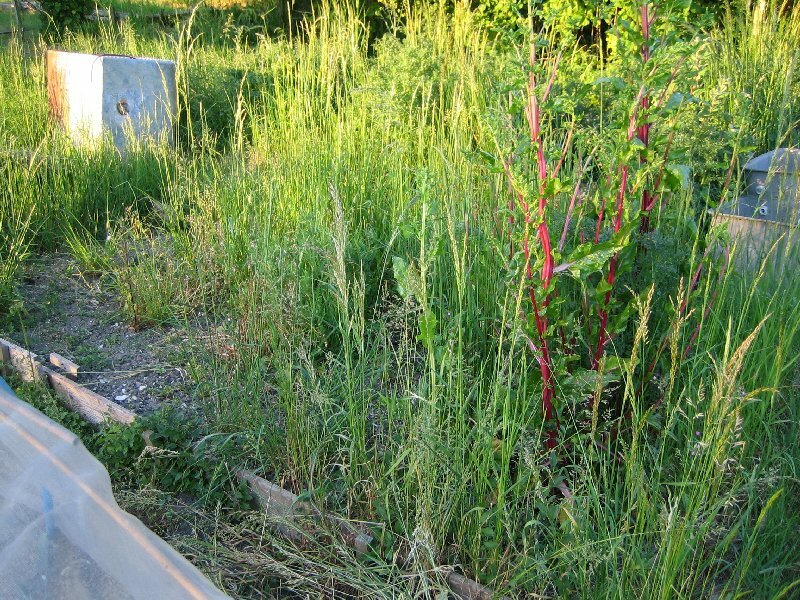 This bed is a total pig to weed. Couch nests everywhere. But eventually I won. Had a wonderful surpise though - after all the trauma of the failed runner beans, five of the ones I sowed directly have actually deigned to grow! So I will get *some* runners, one hopes. 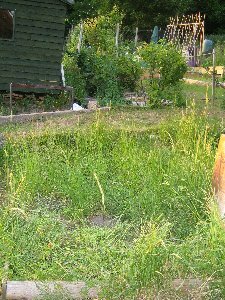 A hot day followed by a hot evening, and close enough to the solstice to allow a lot of weeding. However I didn't really weed as much as I could have done, as I started off by planting the runner beans. Yes! At last! The sweetcorn isn't yet big enough, being a bit on the grassy side still, and the courgettes... well, more later on that! Not many other up there this evening so didn´t stay as late. 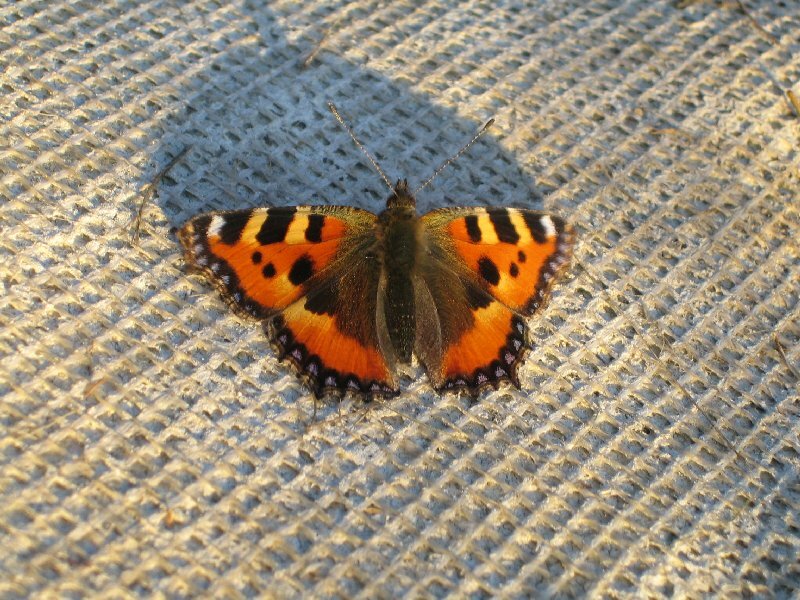 Did spot a small tortoiseshell butterfly sunning itself on a piece of carpet. Anyway, 15 runner beans are now happily planted: the ones that were there have been a bit nibbled so I've doubled up a fair bit, and there are some 20-odd beans over my dozen poles. Must feed them this year since there's no manure underneath, or at least no new stuff... Then watering. Did the beans, then all the cabbages, then did all of Chris's bottom bed. I don't think it's adequate recompense for her strimming the grass for me yet again, but it's all I could do. Then hand-weeded the maincrop potatoes. Bindweed everywhere, but then this is the bed that's full of it. Well there's less of it now and it'll have to use more reserves in growing again. 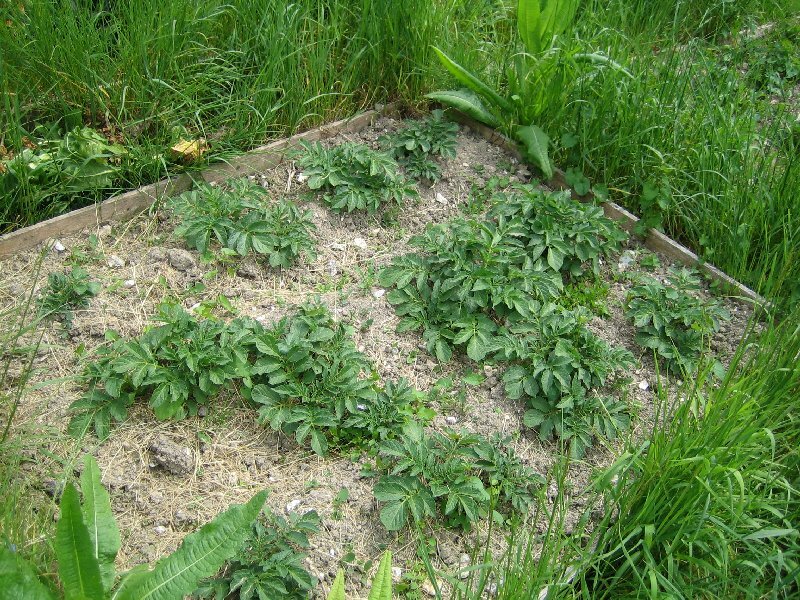 Spuds still look small and weedy compared with other people's. Oh well. Moved on to the next bed to be weeded. Pondered a while as to whether I wanted to do it today but then mentally kicked myself and stuck the fork in the middle of the bed. Crunch. Hang on... carpet! All of a sudden the bed looked a bit more doable. Pulled up the (admittedly) narrow carpet piece and found the usual blanched bindweed but not much else. Huzzah! 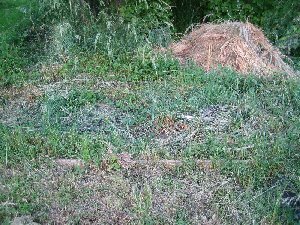 Got weeding the edge bits where the carpet didn´t reach, and in half an hour had finished half the bed. 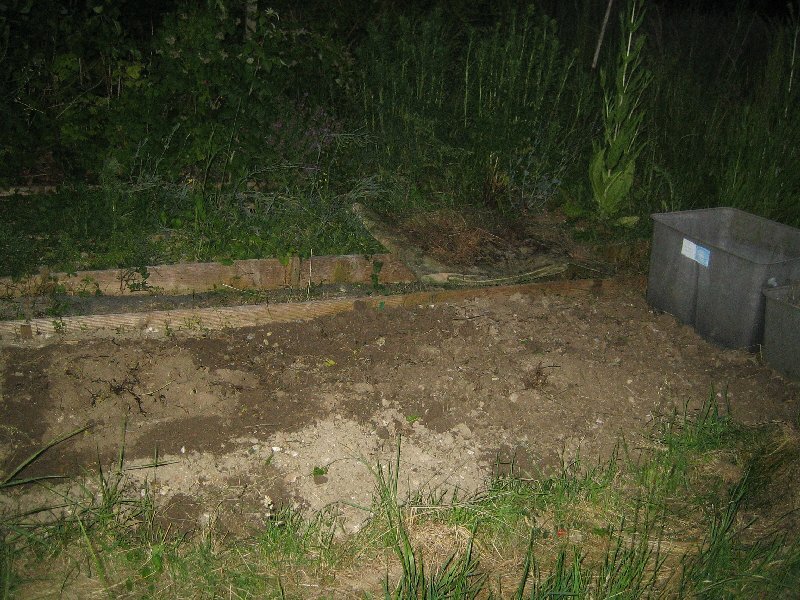 This is the last but one non-abandoned bed on the upper plot, so things looking a bit better. 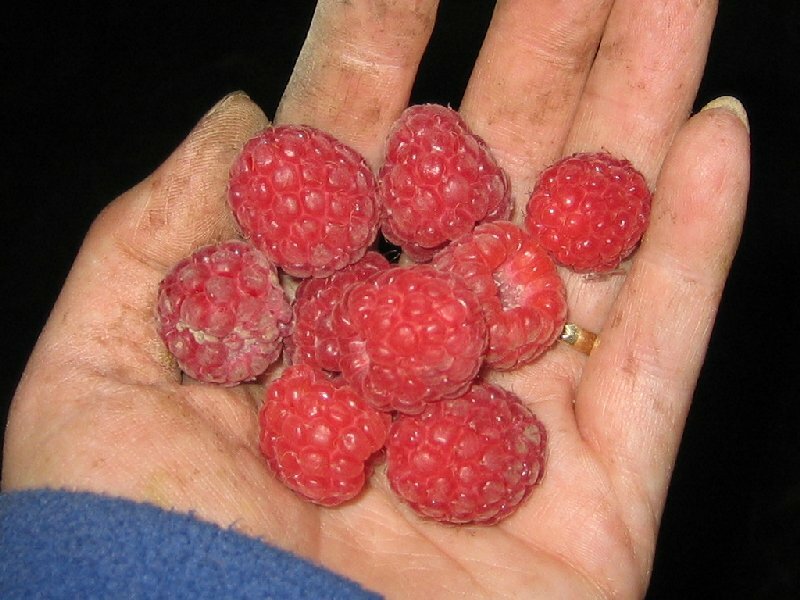 And I picked a handful of ripe raspberries - *bliss*. Next time, the butternuts are coming up with me. The smaller ones haven´t really grown much but the big ones desperately need planting out. And then there´s courgettes. Now have two of the originals up in the roottrainers - argh - this after having carefully planted all those new ones. So I have currently got four trailing marrows and five courgettes, two of unknown colour as I don´t know which roottrainer row was the green ones and which the yellow! Sweetcorn still doing nicely but they also could do with bunging in. Midsummer Night. And a lovely evening it was too. Many more folk up there tonight, watering and the like. Went up with the butternuts and shoved six of them in the bed by the beans and one plant under the beans. Still had three left! Glad to see the runners hadn´t been eaten overnight. Then moved on to the little pot of lettuce mixed leaf seedlings and put them in along the end of another cleared bed. I am aiming to put the courgettes in the rest of the bed. 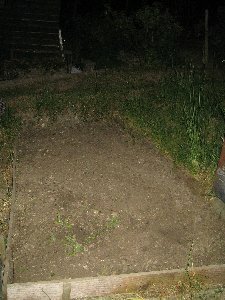 Marrows are going in the couchy bed, mostly because their leaves will shade the underneath and hopefully prevent some of the weeds regrowing. And the corn will go in the bed I started last night. Tonight I decided that the weeding could go hang. Was prompted by Chris to check my green gooseberries - and got a pleasant surprise. Hundreds of them! And large! And no mildew this year! 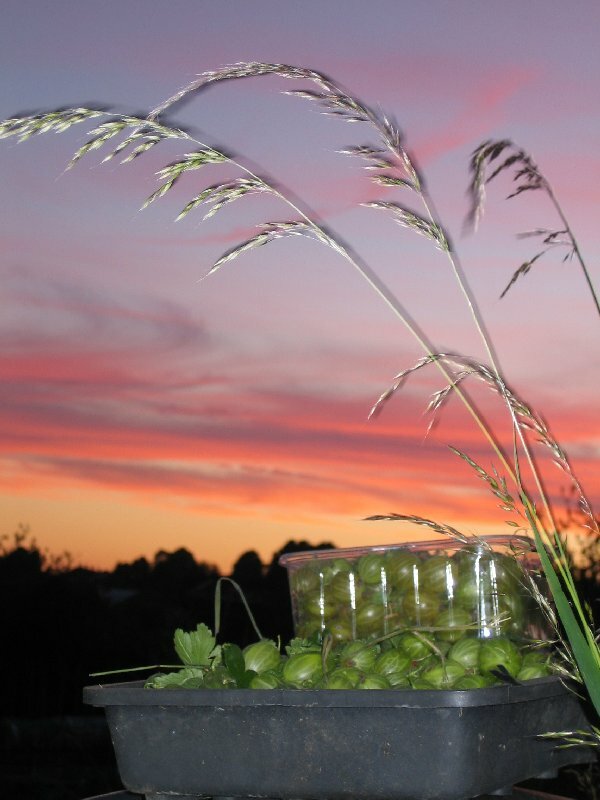 Picked for a short time and realised the punnet wasn´t going to be any use. Went and grabbed a full-size seed tray. Filled it easily. Filled the punnet with the dessert goosegogs instead, after getting covered in sticky buds (goose grass) and ending up pulling it up in handfuls. Attempted to get a photo with both the fantastic sunset and the goosegogs in focus, but failed miserably without a tripod and several seconds of exposure. Got this one using the night scene setting, with the grass waving in the wind. Went home with a trug somewhat heavier than I´d gone, via the Chinese takeaway! Forecast is torrential rain again with thunderstorms. Oh goody. Time to get seedlings and seeds in so the sky waters them nicely. Set the hosepipe to filling the water butts and got sowing. 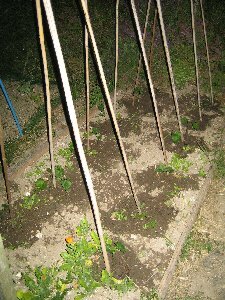 Now have a row of Boltardy beetroot in, two rows of French beans, a row of transplanted self-set chard (as if I've not got enough of the mad stuff!) four courgettes (tiny but what the heck) and, after a lot of weeding to get the latest bed up and running, a block of sweetcorn. Phew. Been busy tonight. So hot though. Need the storms. And my lettuces that were transplanted yesterday haven't been eaten. Yet. 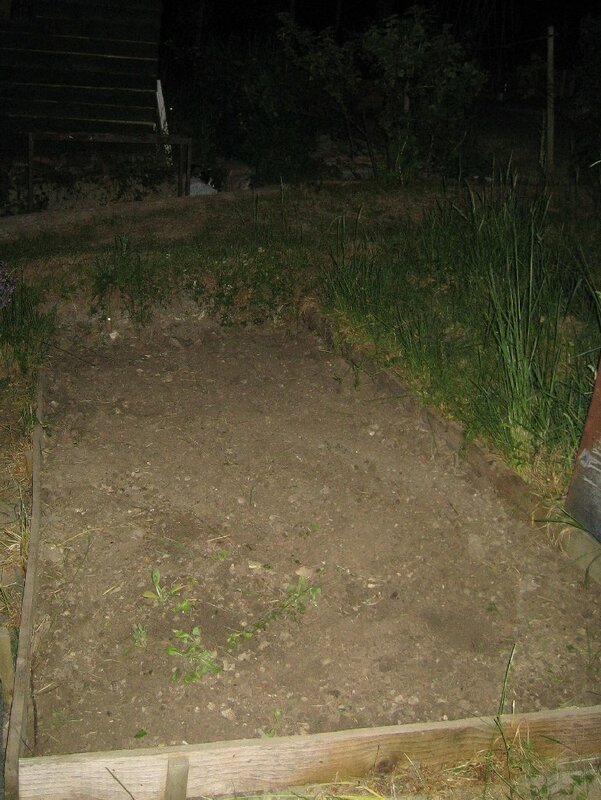 < The After pic to go with Tuesday´s Not Fun photo, and after I´d planted the sweetcorn and a couple of courgettes >. I´ll pop in a trailing marrow or two when they´re big enough, and trail them through the corn stalks. The State of Play: poor old plot 2; still mostly wilderness. I´ll get there eventually!